Co-ordinate your Blend Active and your smoothies with the Breville Blend Active blue- it's quick and easy - just blend...and go! Pop your favourite ingredients into the Blend Active 600ml bottle with blue lid - you get two this model - attach the blade cap and put onto the blender base. The Blend Active will blend a smoothie or shake in seconds. Once blended, replace the blade lid with the pink drinking cap and your drink is ready to take with you wherever you go - to the gym, to work or shopping. With a one-touch operation, the VBL136 is super fast and simple. With a small, but powerful chopper, you can crush ice and chop tough fruits or nuts for a variety of different drinks.Unlike protein shakers, the Blend Active's clever design prevents protein powder collecting around the bottom or the edges for an ultra-smooth drink. Make healthy homemade smoothies, shakes, slushies and protein drinks in seconds. Ideal for the gym, work, school and days out – Just blend & go! 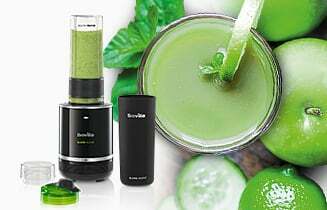 Blend Active with 2 Bottles, Green is rated 4.8 out of 5 by 2259. Rated 5 out of 5 by solin from Amazing Product- Highly Recommend and used many times per day I saw this in a fitness magazine and was very keen to purchase so I signed up to Tesco to notify my when it became available and purchased immediately. I have not been happier with a product (and I am a gadget girl). I have used it everyday at least twice per day sometimes more. It is simple to use and has a 1 touch button which blends really well even when I put a whole banana and 2 whole kiwis in. The bottle is long and slim and I take my smoothie on the train every morning and then use the bottle for my water throughout the day so it serves a dual purpose. I could go on and on but overall a brilliant product. Rated 4 out of 5 by Nass from This should be called BARGAIN Blend Active! I bought this a few weeks ago as I have recently jumped on the smoothie bandwagon. I already had a hand blender but wanted something I can use on the run, and this is the one. Its so easy, you throw your ingredients in, put the blade on, whizz it up , take off the blade quick rinse under the sink and screw the drinking cap on! wa la! The only criticizm I have for this is sometimes if you hold the button for more than a few seconds in one you get a burning smell. Which after reading blender horror stories does of course concern me! However I just use press it for a second at a time til its done! Overall I would recommend this product to all. Rated 5 out of 5 by Anna1414 from Great and easy to use product!! I bought this product about a month ago and I have used it without fail every single morning to make myself a green smoothie. It is very simple to use, easy to clean which is important for me especially as I do not have a dishwasher so its very useful that all I have to clean is the bottle, cap and blades. It blends everything I put into it whether that's apples, spinach or frozen berries to a very nice consistency. This product is very versatile and a great addition to a healthy lifestyle as it means you can get part of your 5 a day in a very delicious way. I absolutely recommend purchasing this product and I'm thinking of buying another one for my mum! Rated 5 out of 5 by fejenningss from Great personal blender I've been looking at the nutribullet for a while, but wasn't 100% sure about how much I would use a personal blender so I thought I'd pick up a Blend Active as it was cheap and cheerful as a 'practice run'. I've since used it almost every day for smoothies - it crushes apples, kale stalks, ice etc. with ease, doesn't get 'stuck' if you add sticky items like peanut butter, and the size of the bottle is perfect. We've also used it in my house for pancake batter and mixes, I'm contemplating trying to use it to crush nuts next! I'm completely sold on the blend active, I don't notice the difference between it and my friend's nutribullet at all in terms of texture etc. of drinks. 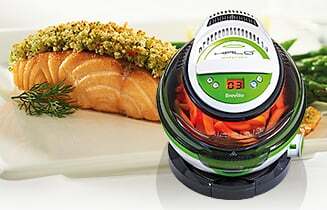 Rated 5 out of 5 by Breville Active from Amazing little gadget! 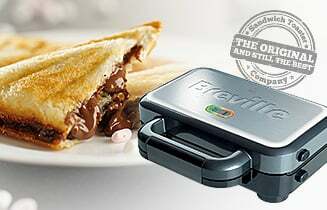 I originally saw the Breville Active advertised on another site but thought it looked great and would suit my needs. I purchased through Tesco direct and have not looked back. It's a great little smoothie blender and is so easy to use. I love the fact that you get 2 bottles and that the blades just un-screw and can be replaced with the drinking spout/ lid. Easy to clean as well, and packs away nicely. The booklet also has a couple of groovy receipes and you can also pop in a few ice cubes into your choice of ingedients. 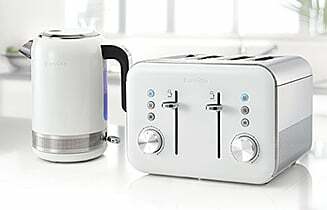 In fact, I have been singing the praises of the Breville Active so much two of my friends have purchased the item and are really pleased with it. Rated 5 out of 5 by TheFizz from Does the job & does it well! We have now had our Breville Active Smoothie Maker for over a month & we love it. We already knew it was worth buying as both family & friends highly recommended it. It is very efficient & providing you use it correctly and do not over fill, it blitzes smooth smoothies. Makes light work of frozen fruits and reasonable sized iced cubes. As for cleaning it is fine in the dishwasher but ours is used everyday and often more than once, and so doesnt make it to the dishwasher. It all handwashes easily. The two large beakers with lids are a great size and very easy to drink from even if like us you prefer quite a thicky icy slushy smoothie. Highly recommend. Rated 5 out of 5 by Dave_D from Awesome Product!! Was really skeptical of this product before I purchased it but i knew if I was really unhappy with it Customer Services at Tesco would sort me out so I bit the bullet. Amazed at how well this product works, I use it to blend banana, frozen berries with yougurt and it has no problem whatsoever. Was a little disappointed when I realised the blend button requires you to stand and hold it but the machine works that quickly it really makes no difference! Already trying to convince friends and family to purchase! great for people who would use it for protein shakes as well. The machine really cuts down on the washing up which means I'm a lot more likely to make a smoothie as cleaning the blender was always the time consuming part! If you're on the fence over whether to buy this product, buy it! I'd pay over twice what I did for this machine! Awesome! Rated 5 out of 5 by Mikey76 from One of the best things I've bought!! I am terrible for buying appliances that never get used but not in the case of this Breville Blend Active. Use it everyday to make smoothies usually instead of a fattening snack. Works particular good with frozen fruit so you need not add ice and on the weekend with alcohol to make delicious cocktail like drinks. The beauty of this machine over other blenders is firstly blends straight into a sports bottle that is intended to be taken to the gym or in bike bottle holder and most importantly the ease in which you clean it for next use - literally takes seconds. Recommended to all my friends and colleagues!!! !